NOTE FOR DELIVERY: Wingard’s truck holds 12 scoops or 4 cu.yds. 1 scoop = 9 cu.ft. = 1/3 cu.yd. 3 scoops = 27 cu.ft. = 1 cu.yd. 1 scoop = 150 lbs. 1 cu.yd. = 450 lbs. 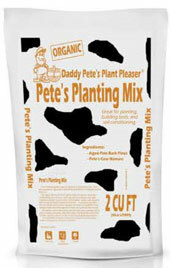 Daddy Pete’s Planting Mix is a peat moss-based soil amendment designed for use with sandy soils, to help them retain water. Simply dig the hole for the plant and mix ½ Planting Mix with the soil removed from the hole. 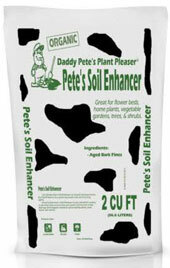 Daddy Pete’s Soil Enhancer is crushed pine bark, to be used with clay soils, to help the absorb the water inherit in clay, so that when you water your newly installed plant, it will not be over-watered.